Kara Floyd, who is student teaching in third grade at El Mirage Elementary School, celebrates as the sail she designed takes the lead over that of Ezra Sanchez, an eighth-grade math student teacher at Surprise Elementary School. Jan Snyder from ASU’s Ira A. Fulton Schools of Engineering runs the fan that provides wind energy. 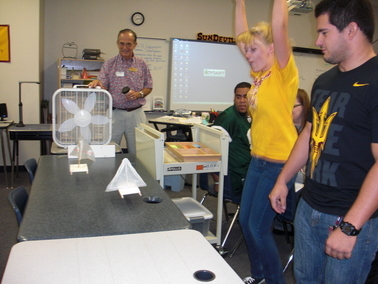 More active learning through engineering education is finding its way into elementary and middle school classrooms in metropolitan Phoenix through an Arizona State University effort to provide young students a deeper comprehension of the mathematical and technological concepts that form the foundations of science and engineering. The new Engineers Serving Education project draws on expertise of faculty members from ASU’s Ira A. Fulton Schools of Engineering and Mary Lou Fulton Teachers College. The project introduces ASU education majors involved in their student-teaching experiences to STEM subjects (science, technology, engineering and mathematics) that they can immediately incorporate into class lessons. During the current semester, these teacher candidates are delivering one or more of four STEM lessons to approximately 1,800 students in pre-kindergarten through eighth grade. Most of the students are in low-income, high-need schools. 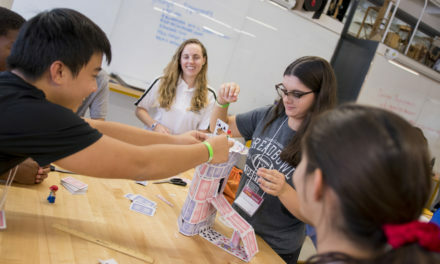 Engineers Serving Education is under way at the ASU Preparatory Academy at the university’s Polytechnic campus in Mesa as well as in six Valley school districts – Madison, Higley, Scottsdale, Murphy, Dysart and Balsz. 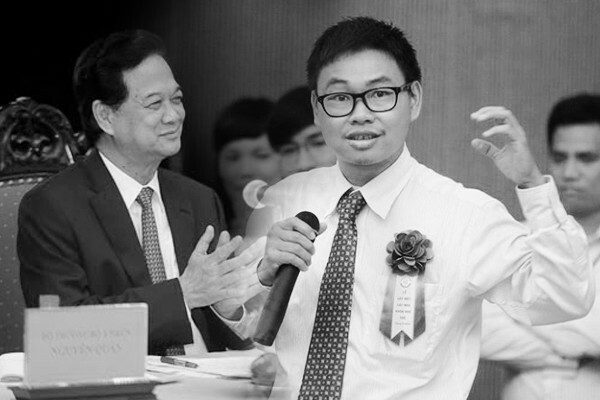 In the spring of 2012, it will expand to an additional 10 sites, involving 300 teacher candidates and their mentors. With that expansion, the project will reach nearly 7,500 additional elementary and middle school students. The resources the two ASU schools have committed to Engineers Serving Education are being augmented by the Boeing Company’s Mesa, Ariz. operation, which has provided startup funds to the Schools of Engineering. “The field of engineering is at the crossroads of math and science, and that’s where the fun is,” said Ron Zambo, an associate professor in the Teachers College who instructs a class on methods of teaching mathematics in elementary schools. Getting young people enthused about STEM subjects is precisely the point of Engineers Serving Education, said James Collofello, associate dean of academic and student affairs in the Schools of Engineering. Stephen Rippon, assistant dean of recruitment, outreach and student engagement in the Schools of Engineering, explained that STEM activities being taught to teacher candidates are designed to evoke a high level of enthusiasm from teachers and students. “These projects give new teachers the opportunity to infuse both math and science concepts into a lesson that focuses on matters of personal relevance to students and for which students typically possess prior knowledge – two essential and powerful learning factors,” Rippon said. The project is being incorporated within the larger context of a redesign of the teacher preparation curriculum by the Teachers College. Under the new curriculum, dubbed iTeachAZ, one-quarter of education classes for students majoring in elementary education are being replaced by classes focusing on academic content to produce new teachers with broader content knowledge. iTeachAZ also expands student teaching from the traditional one-semester model to a full-year experience, during which university students spend four days per week in school classrooms, working collaboratively with mentor teachers and fellow university students, and one day per week taking Teachers College pedagogy classes in partner school districts. When Snyder visited Zambo’s math methods class to introduce the sail-building activity, he visited a classroom at El Mirage Elementary School in the Dysart Unified School District. The second activity taught through Engineers Serving Education builds on concepts introduced in the initial sail-building project. Students design windmill blades to fit on a basic windmill tower and rotor constructed from a milk carton with a shaft made from dowelling. Their goal is to harness enough energy to lift weights. 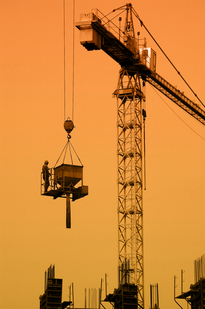 The overarching goal of Engineers Serving Education also involves lifting. 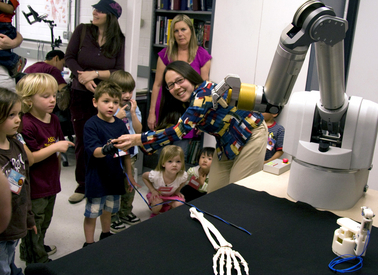 The two ASU schools are committed to forging a sustainable long-term partnership to lift the prominence of STEM education in Arizona’s schools and lift the chances that young people will pursue careers in STEM-related fields. ASU engineering students will also participate in the project. The Schools of Engineering are recruiting up to 200 of its students to work with teacher candidates to facilitate classroom activities. The Teachers College and the Schools of Engineering will partner in assessing the impact and outcomes of Engineers Serving Education. The two schools will assess the program impact on teacher candidates and their mentors. They will also develop and implement tools to measure the value of STEM-related classroom activities and the change in young students’ perception about STEM subjects. Assessment will include measuring the impact of the studies on students’ math and science aptitudes, and the impact on students’ long-term progress in STEM-related studies and careers.